Can the students observe and understand the PET scans? Can the students answer the questions about the brain? Do the students participate in class discussions? 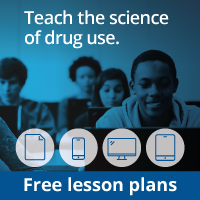 Were the students able to generate new ideas about why people take drugs based on what they have learned so far? Below are some additional activities that can be done after completion of the fourth mission. These activities are extensions to many areas of the curriculum. Play a “game show” using questions about drugs and how they affect the body. The students can take turns being the player, and the rest of the class can be the audience. If the player doesn’t know the answer, he or she has the option of asking the audience for help. Make sure that everyone has a chance to be the player. As a class, go to the Library/Media Center and look for books or Web sites about one or more of the drugs studied during the module. Take the books back to the class and read them together. Discuss the books’ content and how they apply to what the students learned during the module. Make up a class story about drugs. Have each student add a line to the story. Tell the students that the story could be about anything they have learned in the program to date.